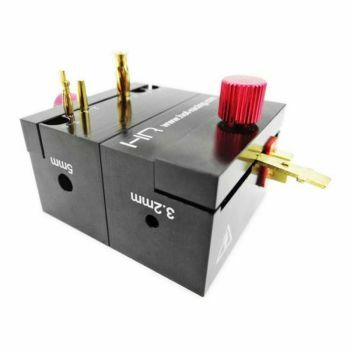 Hot Racing Pro Connector Soldering Jig. Holds most types of RC battery connectors in place for soldering to wires. Holds XT60, Dean's T-connector, Traxxas connector, EC2-EC5, Dean's, Micro 2pin-4pin connectors and bullet connectors from 2-6.5mm. Magnetic two piece design with alligator clips and solder storage. Two alligator clips style holding clamps for wire. Wide aluminum base for added stability. Can also be used as motor holder, fits both 5mm and 1/8" diameter shafts.